This morning I woke to the news that Christopher Hitchens had just died of complications resulting from his cancer. It is a mark of the man’s standing that this sad news should feature so immediately on the BBC, Facebook and Twitter. The timing of his death, the day after Britain laments loosing a manuscript by a teenage Charlotte Bronte to France, has a touch of irony, and if it were not for the fact that he was an ardent atheist I would like to think he would be smiling down on us. Not surprisingly the Today programme on the BBC’s Radio 4 have been discussing Hitchens’s legacy this morning. Sadly, no one mentioned his 1987 book The Elgin Marbles, which has been revised a number of times since, most recently in 2008 as The Parthenon Marbles: The Case for Reunifcation. He took an unequivocal stand against the British Museum who rather naively still argue that more tourists from all over the world see the Elgin Marbles in London. As Paris is the world’s top tourist destination, I dare say more people will be able to enjoy Bronte’s amazing 19 page, miniature magazine in its new home in the French capital than in West Yorkshire. That the British cultural elite tend to want to have it both ways was of course not lost on Hitchens. His enviable ability to take hold of an issue and shake it to its core assumptions meant he was able to cut straight to the contradictions the case for retaining the Elgin Marbles in London presents. His wit makes reading such exposés a pleasure, as the preface to his 2008 edition attests. Christopher Hitchens first wrote about the Elgin Marbles issue when writing for the Spectator, and it was his article published 1 January 1983 that is often credited for reigniting a public debate. 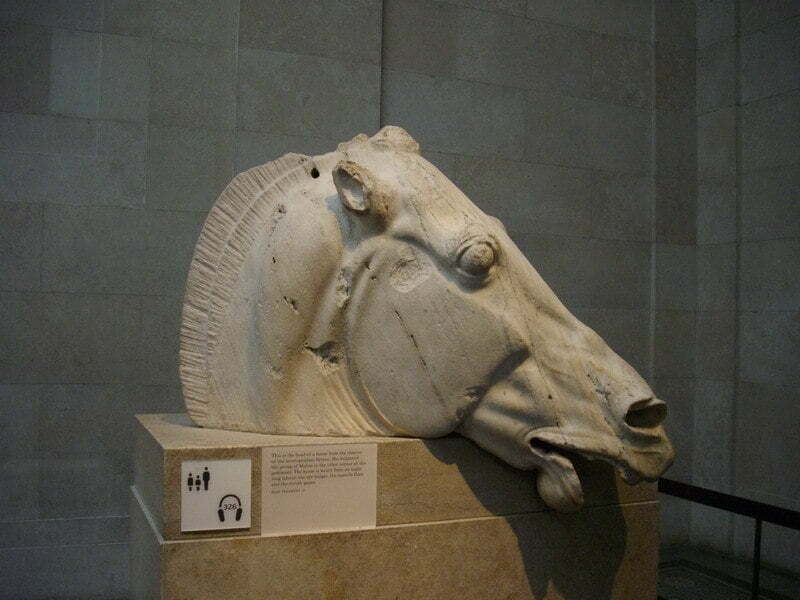 There followed in 1987 then a fuller treatment of the matter in his book The Elgin Marbles. The 2008 edition was produced because of the then imminent opening of the new Acropolis Museum in Athens – which unfortunately but perhaps not surprisingly turned out to be a lost opportunity of grand proportions. Besides a foreword by the South African novelist Nadine Gordimer, a few other more technical essays, some recent photographs, and a preface by Hitchens, the book is essentially much as it was in 1987. With all due respect on this day, the debate about the restitution of cultural objects has moved on substantively since the end of the 1980s. That said, Hitchens’s account of events up until that time is unsurpassed in its investigative subtlety and accuracy. There remain a number of questions raised by Hitchens that the British Museum has yet to answer. That Hitchen’s did not update the book entirely is a great pity, which must have been a great relief to current guardians of the Elgin Marbles. His 2008 preface shows that he was no less able to identify two decades on the “mushy and evasive post-modern babble” of the British Museum and cut to the chase as he was in 1987. A substantial reworking of the book, would not only be a welcome contribution to a debate that is jaw-dropping in its simplicity and ignorance, but it would certainly have provided a much needed response to the neo-colonialist position adopted the British Museum. The best comment about the book can be read in the one negative review of this book on Amazon UK’s website (even the most ham-fisted PI could tell you who wrote the review). In what must have been thought to be a final low and damning blow, the ‘reviewer’ ends: “This was a political, not a cultural or archaeological, gesture.” At least one person gets it then! This is the very point of Hitchens’s account of the debate, such as it is. And, it is this denial of the political nature of the debate about the reunification of the Parthenon Marbles by both sides that can explain why the Elgin Marbles are still in London. When the debate can deal with the politics – appropriately, and by this I do not mean some naive treatment of Greek nationalism, I will be buying shares in the packing crate industry. For anyone wanting to read the history of the Elgin Marbles, a history you will not find in the British Museum’s print or online publications, Christopher Hitchens’s book is a must; its polemical position notwithstanding. Which is more than can be said of any other book that deals with the subject. 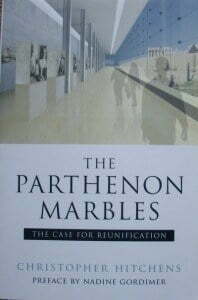 The 2008 edition of The Parthenon Marbles: The Case for Reunification by Christopher Hitchens is available on both Amazon.com and Amazon.co.uk.